Her card arrived at exactly the right moment. I’d started making strawberry preserves and feeling sorry for myself. Not exactly crying in my strawberries, but close. Then I opened Heidi’s card, the butterfly flew out, my spirits flew upward and I had a moment to thank God for Heidi and for all of my family. 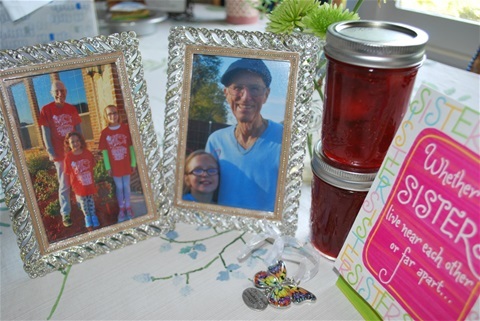 The picture here shows a few, just a very few, of the things for which I am thankful: My adorable husband, John, yes, still adorable after 50 years together; my Texas girls Jessie and Emily, a few flowers left from the bouquet my son gave me almost two weeks ago, and, of course, Heidi’s card, the butterfly, and the strawberry preserves. Wash and hull the strawberries. Pick out half, preferably the largest and firmest and put them in the big pot you plan to cook your preserves in. Add half the sugar and the lemon juice and crush the berries with a fork. Add the remaining sugar, the rest of the berries and stir well. Cook over high heat, stirring, until mixture comes to a full rolling boil. That’s a boil that can’t be stirred down. Transfer this to a 9 x 13 glass dish and set it aside, uncovered, overnight. Next day, get out your canning jars and new lids. 2 lbs. of strawberries will make about 4 half pints of preserves, more or less. Sterilize your jars and lids and set aside so they’re ready when your preserves are ready. Bring berry mixture to a boil over high heat in that same pan you used yesterday. Cook stirring until mixture jells. Now, this is the tricky part. You keep holding your spoon up out of the mixture while you’re stirring, and when it’s really jam, it will drip off the spoon at different points, rather than running off in a smooth stream. Trust me, this works! Add the butter at this point, which keeps foam from forming that you need to skim off. When you know you’ve got jam, take your pan off the range, set it on a hot pad and spoon your preserves into the jars leaving about a quarter to a half inch of room at the top. Immediately put your lids on and screw the bands on tightly. I like to invert my jars so they’re standing on their heads till they cool. That way the fruit is all the way through the jar instead of crouching up close to the top. The lids should not spring back when you touch them. When you spread your own strawberry preserves on your toast, you will be filled with gratitude and thankfulness. Honest! Thank you, Heidi, for being my angel yesterday. I love you.